Knock Your Training out of a Rut! If practice makes perfect, what does that say about folks who do the same workout week after week, month after month, and year after year? They’re probably damn good at it, for sure, but diminishing returns kicked in ages ago. You don’t need to be familiar with the law—yes, it’s actually a law—to realize the big-time gains you initially achieved as a beginner become harder and harder to come by over time. Eventually you hit a plateau, a point in which further gains just won’t occur no matter how hard you try. You can continue to do more of the same and expect—well, you’re familiar with the definition of insanity. Here’s where becoming overly comfortable with a routine is your enemy; your body requires change in order to grow! Your body adapts, and you have to find ways to up the ante so it has to face an even greater challenge. You may overhear bodybuilders talk about “keeping the muscles guessing” as part of a muscle-confusion strategy. Clearly, muscles don’t literally get confused, but the idea is that making intentional changes in your workout allows you to alter the training stimulus to one to which the target muscles have not yet adapted. New stimulus equals further opportunities for muscle growth! We often discuss ways to create change in a workout to ensure muscle confusion. That change can relate to a repositioning of body, foot, or hand placement; altering grip width or stance; pushing a heavier or lighter load to knock you out of your current rep range; substituting one kind of equipment for another, such as cables instead of dumbbells; rearranging your workout order; and even adjusting your rest periods. But rather than change up everything at once, one technique I sometimes use is to alter just oneelement of each exercise in my workout. For example, most of us do seated cable rows with a close grip, but you can also use a wide, overhand grip, or even a reverse grip. Heck, you can even attach a D-handle and do them one arm at a time! Those are all alternatives that can be considered in making just a single change. Small changes such as these work the target musculature slightly differently by modifying the muscle-recruitment pattern. String a whole workout of them together and you create an opportunity to achieve a more significant and altogether new training stimulus. Doing so also helps you focus on your training so it’s not on autopilot; you need to think about what you’re doing! So let’s go through a sample back workout, one that I do fairly often, and see how this strategy can be implemented. There are multiple ways this workout could otherwise change, so don’t feel confined to just the choices I made here. And don’t forget you can use this same approach when training other muscle groups, which can also be easily refreshed. The biggest problem with a body-weight pull-up, and it’s a pretty significant one, is that the point at which you reach muscle failure is dependent on your strength level. While that may seem obvious, for maximizing muscle growth you really want that point of failure to be within 6 to 12 reps. But if you can do 20 reps, for example, you’re well outside the ideal rep target and you’re instead focusing on muscle endurance, not size. Adding more weight—that is, wrapping a weighted belt around your waist—can effectively push you into a lower rep target to more effectively match your goal of building optimal muscle. The opposite is true if you can do only 1 or 2 reps; in this case, you’d want an assisted pull-up machine, which effectively reduces your body weight so you can do additional reps to put you back into the muscle-building rep range. Because your strength levels are highest early in your training session, the first exercise in your workout is the most important because you can tackle the heaviest loads. Exhausting yourself doing highly ineffective sets in terms of building muscle is a lost opportunity. This powerful rowing movement is a staple in any back-building routine, and because you can load it up and move a lot of weight, it should go toward the front of your back training. Flipping your grip and going from a wide grip to a shoulder width one does a couple of things. For one, reverse-grip back exercises recruit the biceps to a greater degree, so you may actually be able to lift a bit more weight. The range of motion is also slightly longer. If you’ve always been doing this move with an overhand grip, the change in stimulus can help boost lat growth. During my early training years, I always opted for the close-grip handle on this classic movement, but not anymore. Here, just substitute the long lat bar and take a wide, overhand grip, sort of the reverse of what we did with the bent-over barbell row. The wide grip has a noticeable effect on your elbows as you pull: With the closer grip, they stay tight to your sides but with a wider grip, the elbows are pulled out almost perpendicular to your sides. And that, according to Wuebben and Stoppani, largely allows you to shift the stimulus to the upper lats. While you can never completely isolate a particular part of a muscle, rows are especially effective at building middle-back thickness (when viewed from the side) by hitting the middle and lower traps, rhomboids, and rear delts. Start watching your elbows as you execute back exercises and their relation to your torso—out wide versus close—because that’s an important key to shifting the emphasis of a given movement. 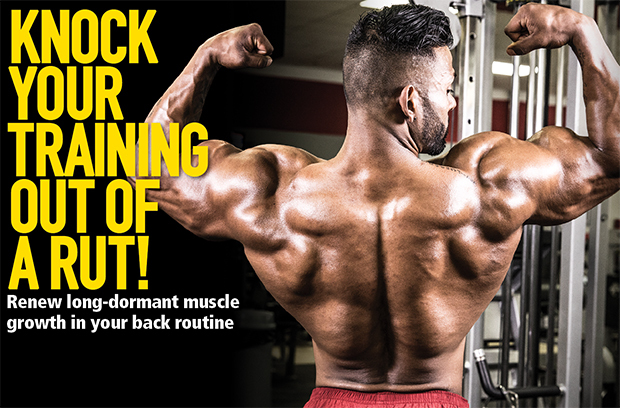 I often use lightweight pull-downs to warm up my shoulders before starting my workout. This movement can also make a good first exercise too if you don’t have the strength to complete many body-weight pull-ups. There are several handles from which to choose here, but for today’s workout, I’ll simply flip my grip on the lat bar. Because I used a wide grip on the previous exercise, I simply wanted to change things up. As with the bent-over row, the elbows stay tight to the side, the lower lats get more of the emphasis, and the biceps help out more than with the overhand version. The one-arm dumbbell row is a staple bodybuilding exercise, and that’s the problem: Staples can be overused. We’ll stick with working each side independently by moving over to the Smith machine, which provides the twin benefits of a greater ROM and better focus. As a mental note, this exercise keeps your elbows tight to your sides. The Smith machine is a nice change of pace, but it’s actually a bit more challenging to do right because of a number of technique nuances that become more natural with practice. For one, you have to get your body positioned next to the bar just right so you avoid hitting your hips as you pull without the bar being too far away. I always use a split stance with my inside leg pushed back almost under the bar. Make sure the pull feels natural for your shoulders because the bar isn’t going to adjust if you’re out of good alignment. And don’t forget, if you’re using an angled Smith machine, you want the bar pulling toward you, not away. To avoid having to unrack the bar when using straps, just start each set in the bottom position. This doesn’t include warm-up sets; do as many as you need but never take warm-ups to muscle failure. Choose a resistance such that you approach or reach muscle failure by the target rep.